Compliments and appreciations bring us closer together. Finding ways to compliment your children can be a very valuable parenting tool. So often we are focused on what our children have done wrong. 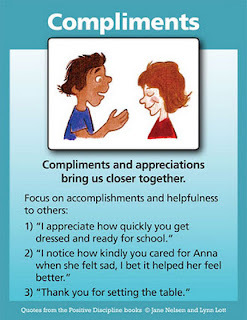 This week focus on what your children have done right and give them an appropriate compliment. "I appreciate how quickly you get dressed and ready for school." "I notice how kindly you cared for Anna when she felt sad, I bet it helped her feel better." "Thank you for setting the table." You will be amazed how this simple act will change the atmosphere in your home. It is also important for children to learn how to give compliments. Siblings don’t have any trouble bickering and putting each other down, but they struggle with the idea of appreciating each other? Maybe it all boils down to training. Giving and receiving compliments is a skill that needs to be taught and practiced. Family meetings provide that opportunity. Begin every family meeting by having each person give every other member of the family a compliment. This may be awkward at first if the children have the habit of name-calling. If this is the case, spend some time discussing the kinds of things they could look for to compliment one another about. Parents can model this behavior by beginning with compliments for each member of the family. Also, if you see something nice going on between the children, remind them to remember it for a compliment. You might even suggest that they write it on the family meeting agenda so they will remember—and their sibling can enjoy seeing it as well as hearing it. Hearing my kids be mean to each other was so difficult for me, so I was thrilled that the hurtful comments were reduced when we held regular family meetings starting with compliments. However, one summer we got so busy that I did not follow my own advice to not let anything interfere with regular family meetings. Bickering and discipline hassles increased tremendously. The kids started insulting one another more often. Finally, I called for a family meeting. The kids had been so mean to each other that I thought they would have difficulty giving one another compliments. However, their years of training came back to them and they gave each other very nice compliments. As we continued regular family meetings the insults decreased significantly, as did bickering and discipline hassles. You can create a positive atmosphere in your family when everyone learns to look for the good in each other and to verbalize positive comments. Please don’t expect perfection. Some sibling squabbling is normal. However, when children (and parents) learn to give and receive compliments, negative tension is reduced considerably. Of course, a positive atmosphere is increased even more when families have regular family meetings to find solutions to problems. When you see someone that deserves a compliment, write it down, or ask a child who also observed something someone else did, "Would you like to write that on our compliment sheet?" Once children develop the habit of noticing compliments, they won’t need reminders. At the beginning of each family meeting, family members can read their compliments. Ask for any verbal compliments that were not written down. Place this compliment sheet in the family meeting binder, and place another blank sheet on the refrigerator to be filled out during the week. Two boys in a class were frequently putting one another down. The problem began to escalate into other issues between them. At that point, the boys brought the topic of put-downs to their teacher for a problem-solving session. At the teacher's suggestion, the boys agreed to keep a record of this problem for a period of time. Together they developed a chart with four categories for data collection. The first column read "Win-Win." To have a check mark in this column, the comment (made by either boy) had to be positive-a nice thing to say and to hear. The next column was headed "Win-Lose." This was for a put-down that one child enjoyed giving but that was at the other child's expense. The third column was "Lose-Lose." This was for any time both boys got in trouble for and felt badly about a put-down. The final column was "Lose-Win." The flip side of the second column, this was for the child who had been on the receiving end of the hurtful put-down. Another feature of this system was that, even though each boy kept a chart, they had to agree on where they would place each mark. They followed this plan for a week and almost always agreed about where the marks should go. Each boy became aware of how often he was using put-downs. At the end of the week, the boys checked back in with the teacher. He asked them what they had learned by gathering the data. As they discussed their observations, both boys noted that they preferred win-win remarks to any other kind. They also discovered that they were now exchanging fewer put-downs. However, one of the boys clearly felt more disparaged and much worse about the put-downs than the other boy. This was an important realization for both of them. After becoming more aware of their own behavior and the consequences, these two students chose to stop using put-downs. In fact, they became friends, and for the rest of the year they frequently gave each other compliments in class meetings. Yesterday I went to the movie with my 3 kids. In the story, the father and his son experiment a huge lack of communication but they reached to reconnect thanks to a very interesting exercise: they asked each other “Tell me what you would love to hear from me?”… What a wonderful idea to connect with your Teen.